Dimensions: 10-5/8" x 3.5" x 15.75"
Dimensions: 7" x 3.5" x 15.75"
Dimensions: 2.25" x 1.5" x 3-1/8"
Pillow Pack, Chocolate Linen Gift Box, 3-3/8" x 3-3/8" x 1-1/8"
Dimensions: 3-3/8" x 3-3/8" x 1-1/8"
Pillow Pack, Chocolate Linen Gift Box, 6-11/16" x 5-1/8" x 1.5"
Dimensions: 6-11/16" x 5-1/8" x 1.5"
Dimensions: 3-1/2" x 3-1/2" x 13"
Pillow Pack, Matte Gold Linen Gift Box, 3-3/8" x 3-3/8" x 1-1/8"
Pillow Pack, Chocolate Linen Gift Box, 4" x 4" x 1-3/8"
Dimensions: 4" x 4" x 1-3/8"
Pillow Pack, Matte Gold Linen Gift Box, 2.75" x 2.75" x 1"
Dimensions: 2.75" x 2.75" x 1"
Pillow Pack, Matte Gold Linen Gift Box, 4" x 4" x 1-3/8"
Dimensions: 4" x 4" x 3-1/8"
Dimensions: 2.75" x 1.75" x 2"
Pillow Pack, Matte Gold Linen Gift Box, 6-11/16" x 5-1/8" x 1.5"
Dimensions: 13-3/8" x 3.75" x 3.75"
Good looking, classy Italian Boxes will enhance your merchandise. There are many options to choose from no matter what items you need boxes for. 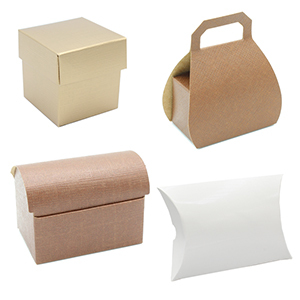 Some of these boxes are great as carriers for glass and jars, others are perfect for scarves and jewelry. You will love the beautiful color options. If you don't see one that works for you, there are other options available, just please call at 800-426-5708.